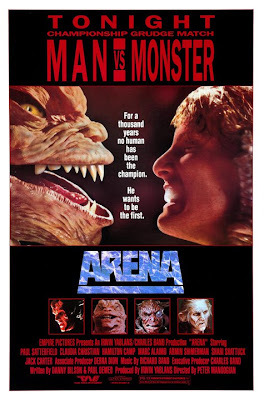 Arena (1989) is the epitome of the greatness that Charles Band used to exude back in the glory years of the late 80s, early 90s when Moonbeam, Empire, and Full Moon thrived. These companies are responsible for creating absolute straight-to-video masterpieces certainly not limited to: Prison, Puppet Master 1 - 5, Prehysteria!, Jack Kirby: Time Warrior, Dolls, and Ghoulies - just to name a handful. These are pictures whose VHS racked up quite the hefty rental fee when I used to bother my mother for them each and every visit. It was never just the adults choice - I always had to have a say which probably made video rental stores the bane of my mothers existence. Lest she soothe a temper tantrum out in public, of course. I got my way and I was happy and look how well-versed in cinema I turned out to be. Exposure is critical in your younger years and Full Moon made for a wonderful gateway addiction and Arena is no stranger to that very same ethos that consumes these beautiful pieces of science-fiction wonder. 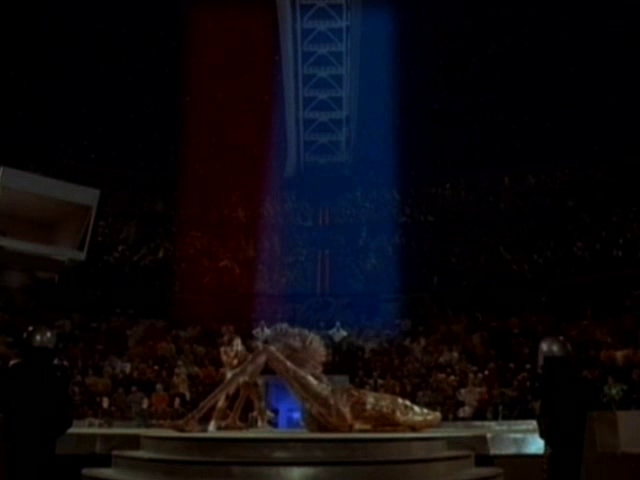 Arena is a combat film first and a bit of runoff political commentary second. Don't worry about the latter of these features as Arena makes sure to shove strange alien creatures involved with martial arts right in your face, distracting from any other facet of filmmaking Arena could possibly meander about. The year is 4038. Such an exaggerated future that there is no possible hope for us to meet and greet this specific year anytime in the 3 or 4 generations one can expect in a normal lifetime. Steve Armstrong is a spacecook in a spaceport with big dreams of relocating to Earth. This current goal greatly overshadows his teen dream of being an arena fighter in a combative sport simply known as "The Arena". After acquiring a significant amount of debt with the help of his boss, Steve Armstrong gets noticed for his fighting talent and joins The Arena with hopes to become the first human champion in over fifty years. With a plot as simple in mechanics as Arena, you'd be surprised just how far this film could have fallen. In fact, Arena surpasses every Full Moon release in quality for the past 3 years alone. In The Arena, it seems so wild that a human could even benefit from competing as its other contenders fit the profile of large, slimy extraterrestrials with a penchant for blood. Yet, Arena positions itself steadfast behind a plot device of a handicap that evens both the fighters' strength, thus making the game theoretically seem like child's play. This doesn't last long, though, until the sinister crime lord, Rogor, discovers a way to malfunction the handicap which endangers the life of Steve. As it is, Arena is that certain type of cinema that is digestible by genre fans of all persuasions. It is the Gerber baby food of science-fiction. Another one of Arena's great strengths lies in its painstakingly created colorful aesthetic which compliments which further compliments the exclusive universe contained within the film. You could argue sources for influence as it is an Empire Picture but it never reaches far enough into its inspirations to become anything more than an homage, if that. The fighting always remains hard-hitting and engaging and the creature designs are top-notch. The previous champion, Horn, is designed as a surly beast biomechanic whose stratagem tactic of injecting off-the-books space steroids results in his repeated victories, which definitely gives Arena a competitive edge. The character of Steve Armstrong is an appreciatory nod to cookie-cutter arrogance and youthful vigor that makes for quite the lead all-American archetype. Match that with its own brand of coy science-fiction humor and you got yourself a peak success in the era where rubber alien prosthetics could do no harm. As an added bonus, Arena features not one, but two lovely ladies - the tomboyish Quinn - fighting manager and go-getting girl - and the lovely Jade - promising femme fatale and overall bombshell. There really is no need for stating the equivalences in this case, Arena IS junk food and have I got a sweet tooth.